While the release is building on my laptop, I have time to write about a few more things I am looking forward to in GNOME 3.4. We has been working hard to make GNOME 3.4 smooth and remove the small things that have been annoying people. But everybody has his own habits, and sometimes you just need that extension to support your specific workflow. This will be much easier from now on; with extensions.gnome.org, extensions are just one click away, and you can try them out right from your browser. Two exciting things in one screenshot: gnome-boxes is beginning to make VM access easy in GNOME, and gnome-shell is running fine in qemu with software rendering. Admittedly, the gnome-boxes release in 3.4 is more of a preview of things to come, but it is already working well enough for simple tasks, such as testing nightly spins. And for software rendering to work, you need recent drivers – the current F17 beta works nicely, as seen in the screenshot. Update: Yes, the aspect ratio of the VM is slightly off; I hear that this will be fixed in F17 final. How awesome would it be to have a baked in download-and-run recipe for Boxes for normal GNOME & Linux (server) instances, and especially preview releases (especially for testing)? Ideally, it could even support some sort of xdelta-like diffing between releases too. 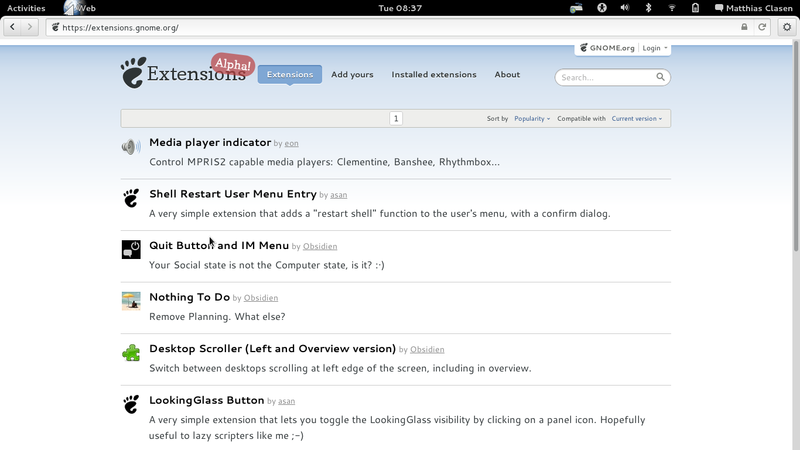 I can see that you’re already using GNOME 3.4 and there are only a few extensions available for that version. We should take this point into account in order to make some useful extensions disappear.